While the American public has waited in vain for a safe artificial sweetener to be developed, citizens of certain other countries have for years — in some cases, for centuries — enjoyed a safe, natural sweetener that is virtually calorie-free and to which many other health benefits have been attributed. This miracle sweetener is a South American herb called Stevia rebaudiana Bertoni — commonly known simply as stevia, estimated to be some 150 to 400 times sweeter than sugar. To judge from the extensive measures the FDA has employed to keep Americans in the dark about stevia, one might assume it was some type of dangerous narcotic. But, in fact, no ill effects have ever been attributed to it, although it has been used by millions of people around the world, in some locales for hundreds of years. So adamant has the FDA remained on the subject, that even though stevia can now be legally marketed as a dietary supplement under legislation enacted in 1994, any mention of its possible use as a sweetener or tea is still strictly prohibited. Now that stevia has been designated as “unsafe” — almost certainly to benefit the politically powerful sweetener industry — the agency has insisted on stonewalling any and all evidence to the contrary. Once the FDA makes a decision, neither practical experience nor scientific research is likely to bring about a reversal of its position. All artificial sweeteners are known to trigger migraines. Each also seems to be known to trigger one or more types of cancer. Stevia has apparently been attributed to triggering ovarian cancer. Those may be extreme cases not often happening, but who wants to be a statistic? Have a laxative effect and cause digestive problems, infertility, muscle pain, among other things. So the claim in this statement that there are “no ill effects have ever been attributed to it” is a false claim meant to alleviate legitimate concerns people have. As far as diabetics are concerned, I’ve had experiences with several diabetic family members. My Grandfather said real sugar in moderation is fine, even with diabetes. He refused any substitute and lived to his mid 80s, passing of natural causes. His two diabetic sisters on the other hand, swore by whatever the latest and greatest artificial sweetener there was. They died of cancer in their 60s. Of course, that could be a complete coincidence. I 100% agree with you that artificial sweeteners are horrible!! Stevia, in its pure form, is a natural sweetener. However, you won’t be able to purchase it in its pure form in the stores. 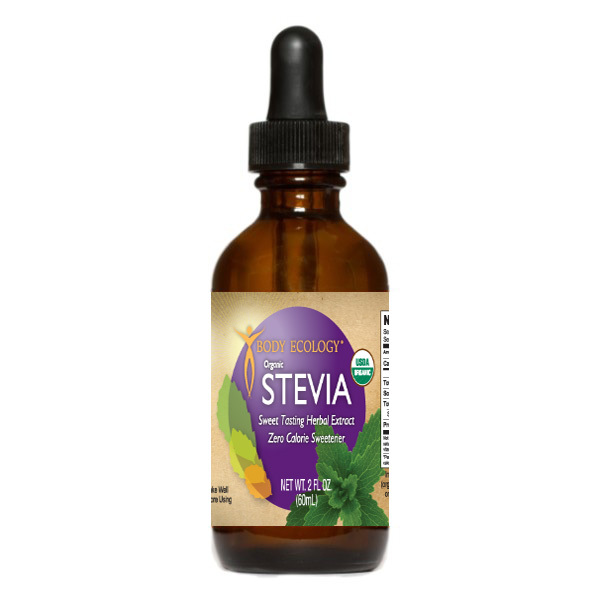 The FDA has not approved pure stevia. What you get in the stores is stevia mixed with dangerous artificial chemicals. So for anyone experiencing harmful side affects, I have to ask if you’ve been able to purchase pure stevia, or are you using that fake stuff they sell you? If you are using the fake stuff, I’m not at all surprised that you are having harmful side affects. I had a mini stroke after consuming stevia. Wouldn’t recommend the crap to my worst enemy. I’m blood type A. Thus stuff names me deathly I’ll. If it was deemed unsafe, why is it, or a derivative of it, in almost everything. Why us it still on the market? Take it easy there, killer. No need for insults. Why don’t the mention the very Report, that caused the FDA to not approve? The one that in Animal Studies it led to infertility and genetic defects…. I have had problems in the past with Stevia giving me a really bad sore throat so I stopped using it but I bought some soy milk by mistake the other day that had Stevia in it. I didn’t read the label because I don’t expect soy milk to contain Stevia so I drank some and sure enough within an hour my throat swelled and became very sore. It used to just get sore but now I’m getting swelling too which is a more serious side effect. It’s 3 days later and the swelling is gone but my throat is still very sore. I think they need to do a lot more testing of Stevia or at least put a warning on it because my reaction is becoming increasingly worse. I don’t think I’m allergic to Ragweed but I am allergic to Stevia. Before the invention of sugar very few diseases were prevailing. Now almost all diseases are attributed due to sugar. Natural stevia besides 20-30 times sweeter than sugar with zero calorie has medicinal properties which no medicine or plant has. It is observed that stevia is detoxifying the body and thus contributing for almost disease free life, inclusive of HIV/AIDS. Psoriasis, Arthrites, Cancers etc etc. I have been using stevia for 6 years with no side effects whatsoever. I have to avoid sugar as I am pre diabetic. In the past I used sugar alternatives like aspartame. Over time, aspartame seemed to lose its sweetness, so I would add more. Stevia did the very opposite. I started with 1 packet and over time it is less than half. Dr Oz introduced stevia to me and I jumped on it for fear of what aspartame was doing to my body. My plan was to quit diet free pop. I used stevia with lemon in water for 3 weeks; presto…sugar cravings finally under control. The only sweets for me are fresh or dried fruits with no additives and dark 72% chocolate with raw almonds. My doctor says my blood numbers are better than her patients with no insulin problems. Granted, I did give up wheat in all shapes and forms once I became aware of the chemicals and additives in processed foods. Of course, I had to have bought a processor. We are all different and for me stevia is my rock. I will not buy stevia from grocery stores. Out of respect for this site, let me say, mine is incredibly perfect. Stevia is a simple green plant wherein the leaves are very sweet. It is not related to sugar and will need an agent to take out the bitter. I buy one that is combined with inulin and trace chromium and has no bitter taste. Guess what company brought us aspartame, and before that saccharine? This is why I side with what the author is saying about the FDA. The company is Monsanto, the forerunner of GM crops world wide with corporate headquarters in St Louis. Over the last few years, ex Monsanto execs have moved to high positions in the FDA. Monsanto relies on political workings to obtain approvals from other countries. I am not saying GE science is bad. In the hands of large chemical giants like Syngenta, Dow, Monsanto and the new one out, chemchina, there is only one objective. Power! I for one do not believe that my family’s health is something I will risk knowing what I know now. I do not trust pharna drugs, so why trust roundup dna in my food. If anyone is interested…an organization in Europe is hosting a tribunal against Monsanto for crimes against Humanity in the Hague next October. To the author… I just could not resist saying what you did not say. Since as their buyers buy bad brands. My favourite is NOW – balance. There is no bitter taste and it has trace inulin and chromium, great for diabetics,. add cinnamon and it is a perfect fix for insulin issues. Another brand I like Sweet Leaf and it is in some grocery stores. I once bought a stevia plant from a Toronto market, but I was too busy to work to figure out how I could mush the leaves. It turns out that the devil company ‘Monsanto’ created aspartame and is heavily involved with the sugar industry as a whole. I’ve been using PureVia for the past three years, and I haven’t noticed any adverse side-effects. No rashes, sores, or stomach aches. And by the way, I am extremely allergic to ragweed (a 4+ on the 0-5 scale my doctor uses). I stir three packets into a glass of green tea one to three times per day. It’s helped me cut down on my consumption of caffeinated soft drinks (my one and only addiction). I know PureVia isn’t exactly pure Stevia (it contains Dextrose), but it does contain Stevia, tastes good, and has virtually no calories. I have tried Kal pure Stevia and had no problems with it either. I’ve read the posts on this site about people having all sorts of problems with various forms of Stevia, and all I can think of is the “post hoc ergo propter hoc” fallacy I learned in college logic. That is, if A occurs after B, then B caused A. I just don’t buy all this “anecdotal evidence,” and I’ll keep on using Stevia. I’ll let y’all know if it kills me. I guess I should also point out that PureVia is GRAS (generally regarded as safe) to the FDA. ..but for thousands of years Stevia has been used as a potent anti fertility agent and no one here mentioned anything about that ! That’s because no legitimate scientific study has ever found that to be true. The reason why Stevia was not approved to begin with by the FDA was due exclusively to the influence of companies that wanted to sell their company made, dangerous, unhealthy sweeteners. In fact, the head of the FDA during the approval of Aspertame was offered a high level job with the manufacturer, and left the FDA shortly after that to take that position. I do not trust the FDA to be anything but a dangerous drug promoting body. Look at all the drugs that are approved and then recalled or sued because of all the damage they do. Is that process protecting people? NO! It is promoting dangerous products with NO oversight! They do NOT care if an approved product harms or kills you, as long as there are profits to be made and bribes to get! And their recommendations about ?healthy? diets is also corrupted by business interests. Looks like they have caught on finally, “equal” in Australia is now selling stevia, still has chems in it though which is pretty cheeky. I use all 100% natural plant extract, hopefully Equal doesnt put the smaller healthier alternatives out of business. Can you send me official reports about this “health benefits” coming from the assumption of Stevia? How much? In what form? How long will it take to give benefits? Because of what? I don’t mean consumer’s satisfaction, I mean facts, numbers. Being a diabetic is a challenge, especially if you need a natural sweetener that will not affect your glucose level in the blood. Stevia is a safe sweetener. It is natural and not dangerous for you like high fructose corn syrup and artificial sweeteners which are KNOWN to cause cancer. Stevia is from a natural plant, much like sugar, and it tastes much better than that artificial crap! The FDA Stevia into our food because it is something that is actually good for us, but they dont hesitate to allow arsenic in our juices, PBA in our canned goods, BVO in some sodas, floride in our drinking water, high fructose corn syrup in almost everything and the list can go on……Then everyone wonders why there is so much cancer and illnesses in the country. It all comes from the air we breath, the water we drink and the food we eat. Who controls most of that? The FDA……. I am currently taking Stevia in my coffee and every thing to cereal breakfast etc. Taste good to me and I believe the FDA is keeping this from us because they are being bought out by the artificial and sugar industries as are the medical drugs getting into our hospitals by big companies having their way instead of whats good for you taking precedence. I was visiting my daughter in Saudi Arabia and bought a product called “Steviana”. I used it as a sweetener in my coffee and it tasted fine. Does anyone have any information on this product. I know the brand you mean . I live in Saudi and have been using this for years. No allergies so far and I am allergic to so many drugs and food items. I found this pleasant but cant use a whole packet in tea its quite sweet. Steviana contains sorbitol and sucralose in undisclosed proportions. So you never know if you are using stevia or the aforementioned artificial sweeteners. If, in fact it was the stevia that made you ill, you are the FIRST person in the history of the world who was sickened by stevia. I hope you didn’t conact the FDA because they don’t need any excuse to start harassing importers of stevia again! What most layment fail to understand is, that diabetics cannot tolerate any prepared food containing sugar. Whether it is sugar from sugar cane, from a plant or from a tree. Sugar by any other name, is still sugar. I have been ill since having had Easter dinner at my son and daughter-in-law’s home. I love this lady with all my heart. However, she works at a health-food store and is a true believer in This young woman served me a very small portion of desert containing Stevia. My next letter or email will be sent to the FDA, who no doubt will be receiving many more. Sugar is not the only thing that diabetics need to watch for. All Starches turn to sugar in the human body. Most deserts contain starch in one form or another. You need to educate yourself on everything that can cause adverse effects on diabetics. You don’t need to watch out only for sugar. Please educate yourself before involving and watsting people being paid by taxpayer dollars. First, be smart enough to know that one incident of ANYTHING does NOT prove ANYTHING!!! Since it was a holiday dinner that you, yourself did not prepare, there could have been any number of things that could have caused you to become ill…jumping to the conclusion that it must have been the stevia is not sound logical thinking and cettainly nothing that could be the basis of any medical conclusion. Second, we are humans and we have been known to have allergies to many things from common to uncommon and natural to man-made. Before condemning a product clearly used safely by half the world, perhaps you should investigate if you are allergic to it as there are Food Allergy Blood Tests done easily through your doctor by a company called ALLCAT TESTING that can test you for many things. I know this because I have had it more than once, and I personally am allergic to Cane Sugar, Maple Syrup, and All Artificial sweetners with the Exceptions od Xylitol and Stevia. So before you involve other government agencies and go one line to make unfounded accusations, think a littler smarter, be a little smarter, and educate yourself with facts. Stevia is not the culprit. Diabetics cannot tolerate any type of carbohydrate; that is starchy food and sugary food. Whatever the starchy or sugary food that you consume, turn into glucose after the digestion. You body need to produce adequate amount of insulin to convert that glucose into glycogen and store it in the liver for future use. People who have diabetes are unable to go through this natural process, so they are left with excess glucose in their blood, which is disastrous. It leads to strokes, heart attacks, blindness, numbness of the feet, fatty liver etc. As a citizen of the USA, I would appreciate you sending me any and all information regarding the herb STEVIA. THANK YOU. As a citizen of Canada, who gives a damn if you are a citizen of the USA. This day and age, I’d be careful about broadcasting that too much. Vince, the real question is who gives a damn if you are a canadian, yawwwwnnnn, what a bore….